Technically the answer to this question is yes; although it’s not something you should ever attempt. 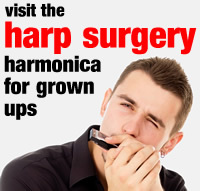 Let’s see what happens when Laurel and Hardy try to out-smart each other on their harmonicas. Stan fools around on a toy trumpet first, then finds his 10 hole harmonica. Can you spot Ollie’s 4 hole Hohner Little Lady half way through the clip? There’s one pictured above. Where do you think it ends up? 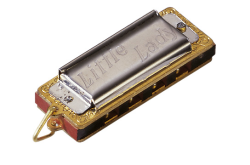 Did you know the Little Lady harmonica was the first musical instrument taken into space? Remember – please don’t try this yourself!